Azaleas are a subgenus of flowering shrubs that can grow up to 6 feet in height and produce numerous large flowers in colors of pink, purple, red or white. 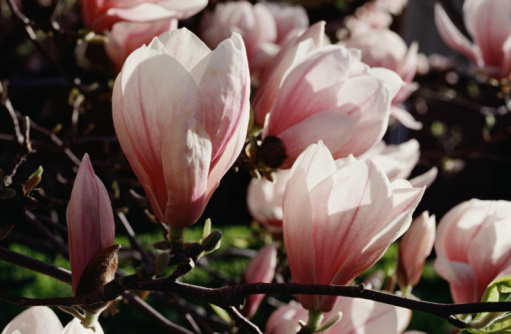 They bloom during the spring and can be deciduous or evergreen, depending on the species. Azalea bushes have a long lifespan with proper care, as some plants can live for as long as 50 years. Azalea bushes require only routine maintenance to survive in most temperate climates around the world. Azalea bushes can live for 50 years with proper care. Plant azalea bushes in a location that receives full morning sun and partial shade in the afternoon when temperatures peak. Ensure the soil is well-drained and fertile by spreading 1 to 2 inches of organic matter over the surface and using a garden tiller to incorporate it into the soil. Dig a hole that is twice as wide and slightly less deep than the root ball of the azalea bush. 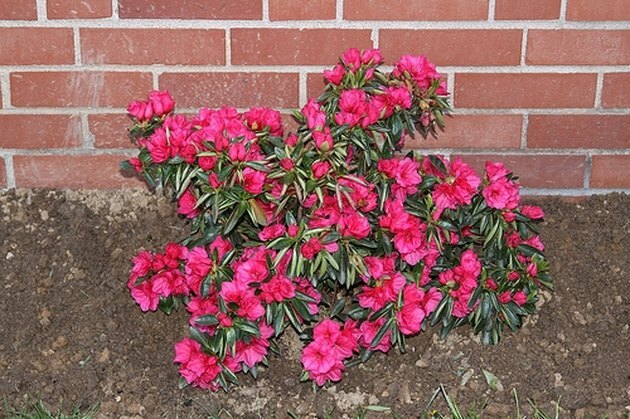 Place the azalea bush into the hole, with the top of the root ball just above soil level. Refill the hole with soil and water thoroughly to collapse any air pockets. Water azalea bushes three times per week during spring and summer. Soak the soil surrounding the plants to bring the shallow root system into contact with as much moisture as possible. Reduce watering during fall and winter to once per week, and only on weeks with less than 1 inch of rainfall. Feed azalea bushes three times per year using a high nitrogen 16-4-8 fertilizer. Apply once in March, again in May and a third time in September. Water the soil both before and after applying to prevent root burn from the high nitrogen content of the fertilizer. Follow the manufacturer's instructions for proper dosage. Remove spent flowers from azalea bushes once per year by pinching them off as close to the branch as possible. This will stimulate the growth of new flowers and prevent azalea bushes from forming seeds. Use pruning shears to remove dead and injured branches in late winter, just before the start of spring growth.